Baggot Court Townhouse Dublin, Hotel Ireland. Limited Time Offer! Baggot Court Townhouse. 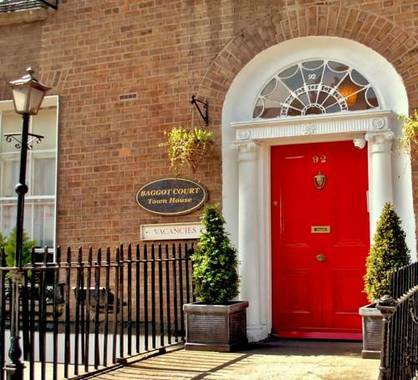 "Baggot Court Townhouse" is a hotel that has received 3 stars. Located in Dublin's downtown area, this residence is a perfect base from which to explore the surrounding area. A shuttle bus can help visitors get around easily. The staff invites you to enjoy the residence's friendly ambiance. The residence has 17 rooms. Thanks to the air conditioning, you will always find a pleasant temperature inside. This accommodation has its own restaurant. End the day at the bar. To add to your stay, there is breakfast available. Staying in touch with your friends and family is made easy by the free of charge Internet access that is provided.